As some of you know we have several AYC boats competing in the Sloop Taven Yacht Club Race to the Straits this weekend. 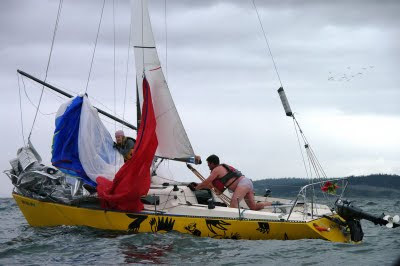 The event consists of a race from Shilshole to Port Townsend on Saturday, and then back on Sunday -- all cumulative time. What makes this event a little more interesting is that it is exclusively for double-handed or single-handed racers. On Saturday the event got started with a brisk southerly and things got a little out of hand at Double Bluff with a certain AYC boat.